It’s never too soon to buy your own hunting property! It can be a challenge to find a hunting spot where you have some room to roam without other hunters all around you. One solution, of course, is to buy your own recreational property. In a recent story in Bowhunter magazine, author Tony Peterson talks about how he has long believed that it’s never too soon to have a hunting property to call your own. Peterson, who hunts in Minnesota and Wisconsin, bought his first hunting property at age 31 – a Wisconsin property that was a bit out of the way and certainly not a prime hunting spot. But it was a start, and he has since bought two other properties to have his own private places to hunt. The recreational land sales experts in the PotlatchDeltic Preferred Broker network are seeing more and more younger buyers like Peterson – outdoor enthusiasts who want a spot for their kids to enjoy and to use as a getaway with their hunting pals. PotlatchDeltic sells land in a variety of shapes and sizes, always striving to match the right property with the buyer’s budget. Now is a good time to be looking for a property of your own: After all, hunting season will be here again before you know it. If you’re interested in buying a recreational property in Minnesota, Idaho, Arkansas, Alabama or Mississippi, PotlatchDeltic’s Preferred Broker Network is the place to start. Call one of our brokers today to get started! 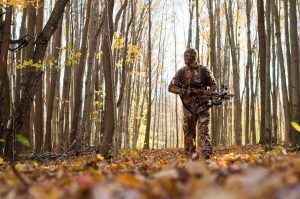 This entry was posted in Hunting, Land Buying Tips, PotlatchDeltic and tagged #LandBuyingTips, Bowhunter Magazine, buying hunting land. Bookmark the permalink.